Top trade officials meet with pro-trade Senators and farmers take to Twitter to tweet importance of trade deal to them. In April, the President indicated he was set to terminate the North American Free Trade Agreement agreement on his 100th day in office, before backing away from the threat. But those threats continue to require those in agriculture to build support for the deal. Over the past several months the fear of withdrawal have increased, but then you continue to hear about Trump’s advisors and those reminding him of the political consequences if Trump messes with NAFTA in a way that does harm to agriculture. Most notably reports indicate on Secretary of Agriculture Sonny Perdue’s first days on the job, he backed Trump off the cliff by showing him a map of all of the red states he won in the election and also reiterated the strong dependence of those states on agricultural trade with the NAFTA countries. Bill Lapp, president of Advanced Economic Solutions, recently penned eight reasons why the fears of NAFTA withdrawal might be overstated. Another reason is positive news from a signing of a tax bill diminishes the need to act on trade issues. “Should a tax reform bill be signed into law, a sizeable amount of pressure on the White House to claim a major political victory will fade away. Enacting new tax legislation could reduce impulse to take over other dramatic actions (especially on trade),” Lapp said. Farmers and ranchers across the country took to Twitter on Dec. 6 to let the President and other administration officials know that staying in NAFTA is a win for farmers. Thousands of farmers and major farm groups made their case with #Farmers4NAFTA with tweets on the importance of the trade deal to agriculture. 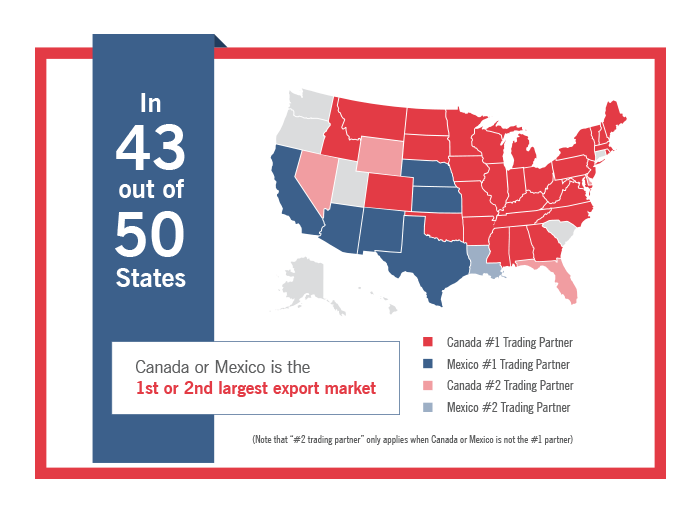 At the beginning of December, several pro-trade Republican members of the Senate met with Trump to continue to reiterate the need to stay the course on NAFTA. During her conversation with Trump, Sen. Debbie Fischer, R-Neb., said she highlighted the significance of NAFTA to agricultural exports and related manufacturing jobs. “I also stressed the need to safeguard the competitive advantage our agriculture producers and manufacturers have worked so hard to build,” she said. On Wednesday, many of the same senators met with Commerce Secretary Wilbur Ross. Sen. Jerry Moran, R-Kan., and Senate Commerce Committee chairman John Thune, R-S.D., had sought a meeting with Ross to engage on trade and the direction of NAFTA negotiations. Fischer did say Ross was forthcoming about where trade negotiations currently stand in the Dec. 6 meeting. “He shared examples of the priorities the administration is focused on as they develop NAFTA 2.0,” she said. Ross has ruffled some feathers with recent comments about agricultural interests making the NAFTA talks harder when they start “screaming and yelling publicly” about their concerns over negotiation proposals. Writing in an editorial published in The Hill on the same day as the meeting with Ross, Senate Agriculture Committee chairman Pat Roberts, R., Kan., said he has taken his concerns with the NAFTA renegotiation and international trade directly to Trump not once but on four different occasions. Jim Mulhern, president and chief executive officer of the National Milk Producers Federation, was on hand during the fifth round of NAFTA negotiating sessions held in Mexico just before Thanksgiving. He said he’s cautiously optimistic about where things currently stand. “While President Trump’s threat of withdrawal from NAFTA cast a pall over previous negotiating rounds, there was less focus on that threat as negotiators tried to move forward on some of the less controversial issues,” he said. National Grain & Feed Association (NGFA) President Randy Gordon said a big focus in agriculture is to keep a seat at the table. “Let’s continue to have these discussions and negotiate in good faith,” Gordon said. Discussion points about equivalent trade balances don’t take into consideration the vast trade surpluses the U.S. enjoys in NAFTA, he explained as an example. “With Mexico holding presidential elections in June, it is generally viewed that major progress toward an agreement must be achieved by the end of March. The longer this process drags on, the greater the likelihood that an impasse could derail the negotiations,” Mulhern said. Gordon said a holding pattern is projected to continue even through January, but then negotiators will need to roll up their sleeves and try to deal with the tough issues the U.S. is trying to negotiate. During the NGFA County Grain & Elevator meeting on Dec. 4, Blu Putnam, chief economist and managing director at CME Group, said it may be increasingly difficult to get anything done before July 1, 2018. Mexico’s elections make it difficult to sign any treaty that would make it appear that Mexico is siding with the U.S. Canada’s Prime Minister Justin Trudeau also faces growing opposition from his Labor Party side. This week, NAFTA officials from Canada, Mexico and the United States will resume trade negotiations kicking off a week of technical meetings. The talks, which will run through Friday, Dec. 15 at the Mayflower Hotel in downtown Washington D.C., come less than three weeks since the fifth round of NAFTA negotiations wrapped up in Mexico City. Groups focused on top-line issues like agriculture, investment and government procurement are not currently slated to meet face-to-face this week.